You are here: Home / Elliot Waves / Can a Chart Pattern Help You Catch a Strong Bond Rally? Yes. The Wave Principle is the best forecasting tool in existence. [It] imparts an immense amount of knowledge about the market’s position … and its probable ensuing path. Elliott Wave International recently applied their knowledge of Elliott wave price patterns to the bond market, and the forecast they shared with their subscribers turned out to be … well, you be the judge. As shown in the chart above, the consolidation in bond futures prices from December through February took the shape of a triangle, a formation that typically appears in the wave four position within an impulse. So, this month’s new low in bond prices is likely occurring within a fifth wave from last year’s high, suggesting that a substantial rally should develop this spring. 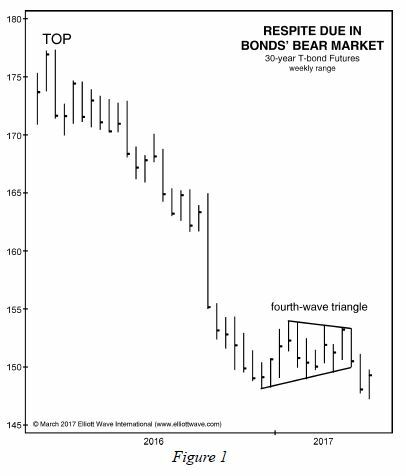 The Elliott Wave Theorist published March 17, and its forecast for a “substantial rally” proved timely: The 30-year U.S. T-Bond price low of 145^26.0 registered on March 14, and since then, long-bond prices have indeed moved northward. As you can see, the price rallied to a high of 155^16.0 on April 18 — a 6% advance in a month! Recently, after a short retreat, the climb resumed. Before concluding, let’s briefly shift focus to the stock market — specifically, the claimed average gain of 7.228% during the past 116 years that investors have allegedly been making annually. “Buy and hold” proponents often point to that annual gain figure. Problem is, in reality, investors pocket substantially less — and that has direct implications for your portfolio. Download your FREE issue from Robert Prechter now — for a limited time.